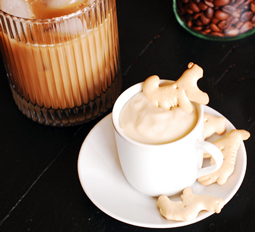 Jeremiah's Pick Iced Coffee Dip - A recipe from Savor California, the online showcase for extraordinary gourmet foods and beverages from California. Brew coffee or set aside 1.5 tablespoon from your morning cup. Add cream. In a small bowl, stir the cream cheese with a spoon until smooth. Add powdered sugar and stir into the cream cheese, alternating with the iced coffee. Serve with biscotti, (animal) cookies, or graham crackers.